Wyoming is one of the most popular destinations in the United States due to its large tracts of open sky and many natural resources. Wyoming is quite a large state and trying to figure out exactly what to do can be tough. I’ve put together my top five RV sites, parks, and grounds for Wyoming so you know exactly where to go when visiting the Cowboy State. We urge all RVers to catch a glimpse of the iconic Devils Tower at least once in their lives and what better place to stay than the Devils Tower KOA. You’ll have all of the amenities and features you’ve grown to love at KOA campsites such as full utility hookups at every site along with Wi-Fi access. You can expect laundry facilities, showers and restrooms to be clean and tidy. The Devils Tower KOA rounds out its amenities with a café, general store, heated pool, gift shop, propane refill and much more. Devils Tower made a great cameo in the movie Close Encounters of the Third Kind and we suggest taking part in the nightly viewing of this film before going on a nighttime hayride around Devils Tower National Monument. You’re also very near the gorgeous Keyhole Reservoir and Keyhole State Park for some on the water fun. Amateur archeologists will have a blast at Vore Buffalo Jump and if you’re trying to squeeze in some sightseeing have no fear as Mount Rushmore is less than a half hour due east from this KOA. Try Indian Campground for gracious hosts, lovely views, and friendly campers. The RVer has plenty of amenities and facilities, the sites are large and pull-through and outfitted with full utility hookups on top of cable TV and wireless internet. Showers, bathrooms, and laundry facilities are rigorously cleaned for camper use. There’s a fenced in off leash area for Fido, a book trade for avid readers, swimming pool, propane fill ups, RV and camp supply store and more at Indian Campground. Indian Campground and Buffalo, Wyoming are loaded with beautiful views of the Wyoming landscape. Downtown Buffalo has been around for quite a while so you can check out many historic buildings and shops like Gatchell Museum of the West. The local area is also full of history, hop on the Bozeman Trail for a great trek and some famous sites like the Fetterman Fights and Fort Phil Kearney. 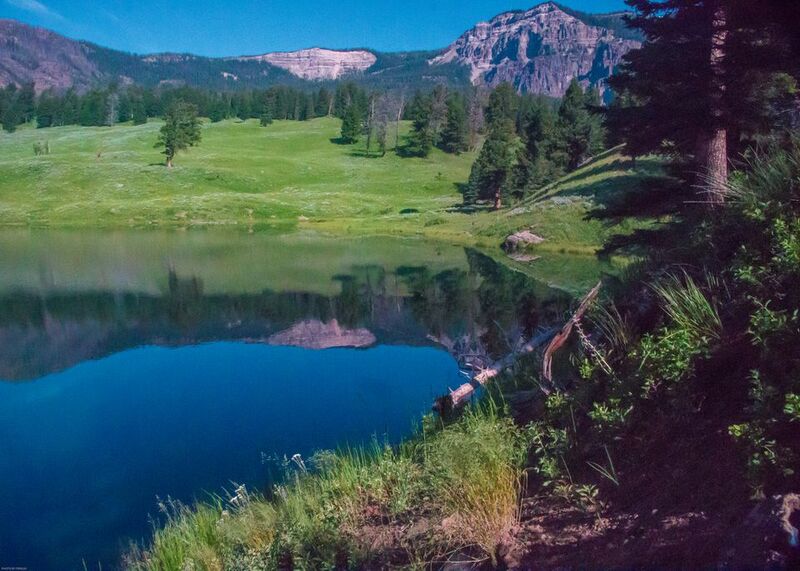 Outdoor enthusiasts can tromp off into Bighorn National Forest, home of the Bighorn Mountains for some lovely hikes ​and to glimpse the breathtaking flora and fauna of the area. Stay at a lovely RV park and explore all the fun the unique town of Jackson at the Virginian Lodge RV Resort. Virginian Lodge boasts 103 RV sites with 30/50 amp electric to go along with water and sewer hookups, as well as cable TV and Wi-Fi access. Each site also has a small lawn, picnic table and a tree for shade. You have a flurry of different amenities and facilities like showers, restrooms, laundromat, a restaurant, saloon, hot tub, swimming pool and even a tanning salon. Virginian Lodge is also conveniently located next to all the fun of Jackson Hole and Jackson Hole has plenty for everyone. Nature lovers will love exploring the Laurance Rockefeller Preserve, National Elk Refuge or any of the other many natural local areas, you can explore them on your own or take guided tours. If you’re purely a sightseer, try the aerial tramway or the National Museum of Wildlife Art. If you’re a big snow skier you can still hit Jackson Hole in the winter for some excellent powder and terrain parks. Jackson is just full of unique things to do and places to see. Fishing Bridge RV Park is one of the only RV sites with full utility hookups in all of Yellowstone. The amenities and facilities won’t blow you away but considering its location this park is fantastic. Fishing Bridge does have full utility hookups, pay laundry and pay showers and dump stations. The park is also within a short walking distance from fuel services as well as a convenience store with groceries and camping supplies. You aren’t just near Yellowstone, you’ll actually be waking up every morning in Yellowstone. Fishing Bridge itself is located near Yellowstone River and Yellowstone Lake for some fishing or boating action. As for the rest of your time there, well that’s up to you. This is America’s first established National Forest and is full of valleys, peaks, and unique geological activity, you’re actually hiking on top of one of the most potentially powerful volcanoes in the world! Yellowstone isn’t the only major National Park in Wyoming, you have to give Grand Teton a visit as well. Like most National Parks, Grand Teton doesn’t house a lot of parks with hookups but you can get them at Colter Bay Village Campground. RV sites come with full utility hookups with a picnic table to boot. There’s a central comfort station with restrooms, showers and a laundromat nearby as well. You can stock up on supplies at Colter Bay’s general store or grab a bite to eat at the John Colter Café Court. This park is all about location. You are right on the gorgeous Jackson Lake full of angling and boating opportunities. You are also in the heart of Grand Teton National Park itself so there are plenty of hiking and biking trails as well as some flora and fauna to check out. You also near all the fun of the resort town of Jackson Hole. You’ll be hard pressed to run out of things to do at Colter Bay. Most people cringe if they travel to Wyoming because there’s this impression that nothing exists there. There’s so much wilderness, National Park land, and more awaiting RVers.